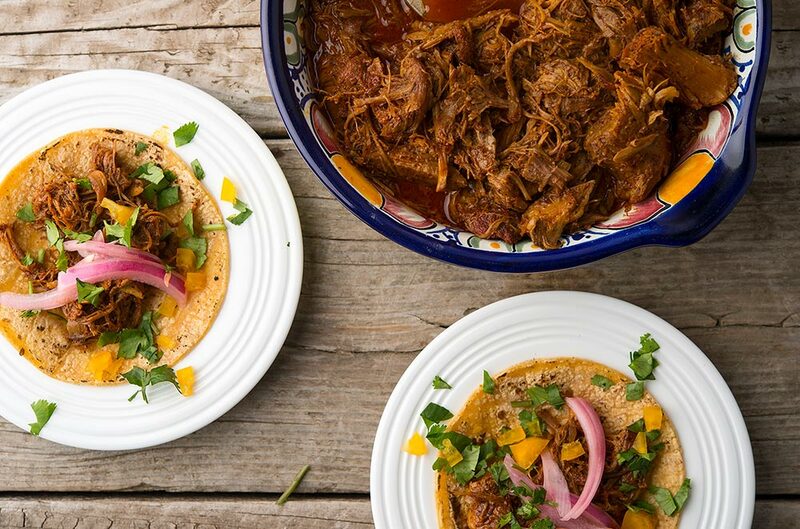 The second after I shot my first javelina, I knew what I’d cook with it: Cochinita pibil. 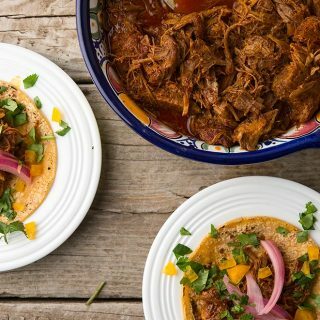 This is one of the signature dishes of the Yucatan, pork (or chicken or venison) slathered in an exotic-tasting spice mixture, citrus and herbs, then slow-cooked until it falls apart, then served on tortillas or with rice. It is spicy without being picante, although it’s often eaten with minced habaneros or hot sauce at the table. Pickled red onions are a must. Pronounced ko-chee-nee-tah peeb-eel, cochinita pibil is also call puerco pibil when made with an older hog. Pibil refers to a pib, an earth oven — basically a pit in the yard you cook things in. Most people these days cook their pibil in a pot in the oven, though. Holly was the first one to introduce me to this dish. She used pork shoulder and it was phenomenal. I was hooked. But the dish never shows up on the menus of really any Mexican restaurant I’ve ever been to, largely because most of the Mexican restaurants here in America are run by people from Michoacan, Jalisco, Guanajuato or Nuevo Leon. None of these are terribly close to the Yucatan. And remember folks, Mexico is a big country. We often forget that. 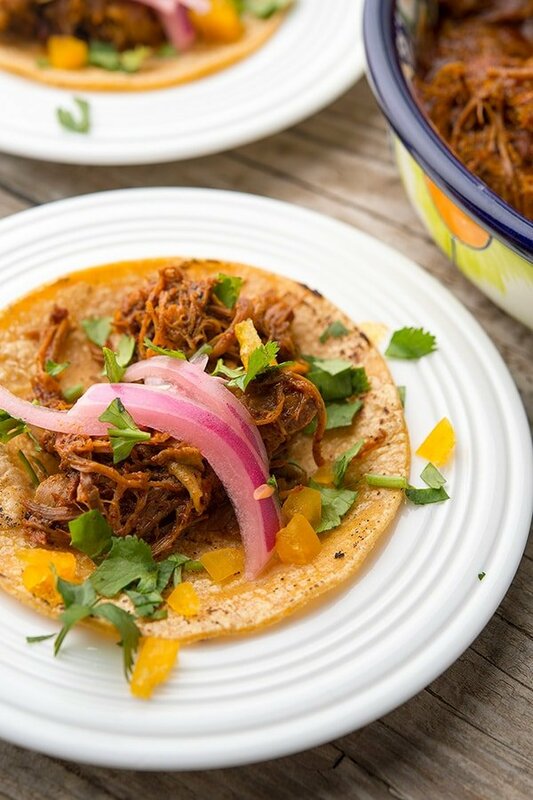 My next exposure to cochinita pibil was in the movie “Once Upon a Time in Mexico,” where a CIA agent played by Johnny Depp shoots anyone who makes this dish perfectly — to maintain balance in this world. It’s an odd sidenote in a great movie, but it highlights this dish the way “Big Night” created the timpano craze. What got me thinking about cochinita pibil lately was the amazing book Yucatán: Recipes from a Culinary Expedition by the late David Sterling. It is the best regional Mexican cookbook I’ve ever seen, and it really highlights how different Yucatecan cuisine is from that of the rest of Mexico. If you are at all interested in the cooking of the Yucatan, you need this book. My recipe below is heavily influenced by his, and my recipe for the red annatto spice mixture called recado rojo is right from his book. The dish hinges on two ingredients that seem harder to get than they are: Achiote paste and bitter (Seville) orange juice. In a perfect world you’d use real Seville oranges and make your own recado rojo, but guess what? Most people here in America don’t. They buy pre-made achiote paste made either by El Yucateco or El Mexicano. Surprisingly, again, given the dominance of Mexicans not from the Yucatan here in the United States, it is very easy to find in any Mexican market. And many places you can find bottles of jugo de naranja agria, which is Seville orange juice. That’s what you want. Barring that, mix regular orange juice, lime juice and grapefruit juice to get you close; the ratio is below. It looks like it is soaked in chiles, but it isn’t. In fact, cochinita pibil is not hot at all, unless you want it to be. I do, so I mince either habanero chiles or the more delicious, less hot (but still zippy) chile manzano a.k.a rocoto chile. it’s Capsicum pubescens for those inclined to Latin. Once you locate the achiote paste, this is a ridiculously easy dish to make with pork in all its forms, light-meat birds like chicken, turkey or pheasant, and even venison shoulder — which is actually done in Yucatan, where they hunt whitetails and brocket deer. And given the strength of spice and long cooking time, this is a great way to eat an old, trophy buck or a big ole’ boar hog. To pickle the red onions, slice one from root to tip thinly and put the slices in a bowl. Sprinkle salt over it and then add about 1/4 to 1/2 cup freshly squeezed lime juice. Freshly squeezed matters, as the bottled stuff will impart a strange, metallic taste to the onions. Massage everything together for a few seconds, then cover the bowl and let the onions sit for at least 30 minutes, and up to a day. To make a substitute for the Seville orange juice, use the following ratio: 2 parts orange juice, 1 part lime juice, 1 part grapefruit juice. Use yellow grapefruits if possible. And yes, fresh squeezed matters a lot here. But if you are stuck with bottled juices, it’ll be OK, just not as good. Do yourself a favor and learn this dish. You won’t be sad. Unless you have a pit in your yard, you can't cook this in the traditional way, which is to wrap the meat and marinade closely in banana leaves and slow cook it in a pib, an earth oven. But cooking your cochinita pibil in a regular oven is pretty close -- only you'll want to get as much smoke into the deal as possible. I find using smoked salt works well, and if you can get some, use it. If not, no biggie. The weird herbs in this recipe, the epazote and avocado leaves, are actually pretty easy to find in Mexican markets, and chances are there's one near you. If you can't find them, skip it. If you are making your own recado rojo, the achiote paste, grind the annatto seeds in a spice grinder. The seed are hard, to you will need to grind, sift into a bowl, then grind some more. When the seeds are ground into a powder, mix them with the vinegar and set aside. Incidentally, you can get powdered annatto, but unless it's bright red, don't buy it -- the flavor gets old and stale fast. Put the oregano, cumin seeds, peppercorns and allspice into the grinder and grind that into a powder. Add it to the bowl with the achiote. Move the spice mixture, the garlic and orange juice to a food processor or blender and process until you get a thick paste. This will keep in the fridge for months. Get a heavy, lidded pot that will hold the meat snugly. You can either keep the meat on the bone if it will fit into the pot (javelina shoulders do), or cut it into pieces that will fit. If for some reason you are using hind legs, you will want to cut the meat across the grain into hunks about 2 to 3 inches across. If you don't do this, you will have very long strands of meat when you are ready to eat it, which isn't so nice. Mix the achiote paste with the lard, salt and enough bitter orange juice to make a sauce like a very thick BBQ sauce. Put the meat into the pot and pour the sauce over it. Massage the sauce into the meat as best you can (maybe wear gloves, as the annatto stains unless you wash your hands the second you're done), and, if you have time, Set everything into the fridge for up to a day. You don't have to do this, but a long marinade is traditional, and helpful if you cook at high-ish temperatures. When you are ready to cook, take the meat out of the fridge and sprinkle the epazote and avocado leaves over it. Cover the pot and put it into a 250°F oven. If you do this, the meat will take between 6 and 8 hours to cook, but will be of better texture. If you are in a bit more of a hurry, set the oven to 300°F and the meat should be ready in 3 to 4 hours. When the meat is ready to fall off the bone, shred it with two forks. With wild pigs or javelina, I like to add anywhere from 1/4 cup to 1/2 cup of lard to the mixture, to keep it from getting dry. Serve on tortillas with pickled red onions and some minced habaneros. Drizzle a little extra lime or bitter orange juice on it when you serve your tortillas. If you want to make your own achiote paste, you prep the garlic by essentially setting the head of garlic on a gas burner and letting it catch fire. Obviously run the stovetop fan on high while doing this. Use tongs to move the garlic around, so it all cooks reasonably well. Let it cool and peel. You'll have some blackened bits, and this is good. Just don't incinerate the whole thing. Find all sorts of recipes for wild hogs, javelina and bears here on Hunter Angler Gardener Cook! Hi Hank, I’m a bit new to cooking with boar as I finally got my first one this year. I’m trying to figure out what to do with the hams (I had the butcher leave them whole & unsmoked thinking I might be interested in doing a boar prosciutto). In the case that I find myself in over my head with the curing route, can I use this recipe or any other slow roast or braise recipe for the whole hams? Thanks again from a fellow Sacramentan! Ryan: Sure, you could use this recipe for a whole ham. Just slow cook it until you can shred the meat.